Eyes: A light hazel: leans more towards light brown with shades of light green. Hair Style/Feathers: Short on the sides, but longer at the top. The front is usually swept upwards to stay out of the face. Scars: Multiple, really. Two that intersect one-another on his upper right forehead above his eye, one on his left shoulder, one on his left bicep and one on his right lower arm, on on the right side of his chest, and one on his left calf. He also has very faint burn scars on all ends of his limbs. 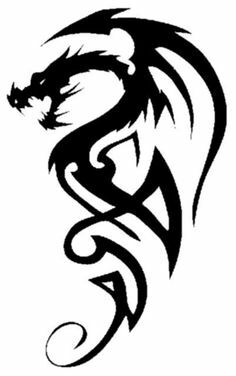 Tattoos: One, medium-sized, on his left bicep of a dragon, colors ranging from red, to orange, to yellow hues, starting from the bottom to the top. Piercings: None; he doesn't want anything to get caught in battle. Other: He usually looks dapper as if he tries, but in reality, his appearance comes natural to him. Constant Wear: His constant wear is essensially his armor. He carries what he owns with him everywhere, so having many different types of clothes isn't an option. He wears fur thin clothing beneath all armor, for firsts. 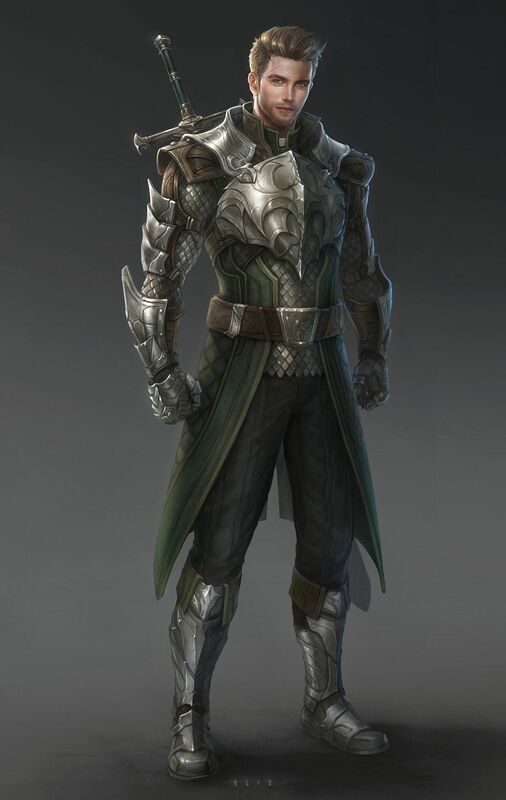 He then has a thick layer of leather armor of different shades (brown and black)and then scaled steal chainmail. Finally, a green outer coat, exterior leather armor, and exterior steal armor. Many layers, for the many cold winters. And villains. Weapons: He carries a long, thick-bladed greatsword. The sword was given to him by his father, first created by his great great grandfather. He takes great care for his weapon, and repairs it whenever need be. It is said that, his great great grandfather had the blade blessed by magic so that it could resist it. Unlike most enchantments, this magic blessed by the blade allows it to block most magic much like a shield, if the blocking is done properly by the blade's wielder. With time, it is said that with enough practice, some magic can actually be parried back to the magic user. It is a very sharp and strong blade, allowing it to survive generations of use. 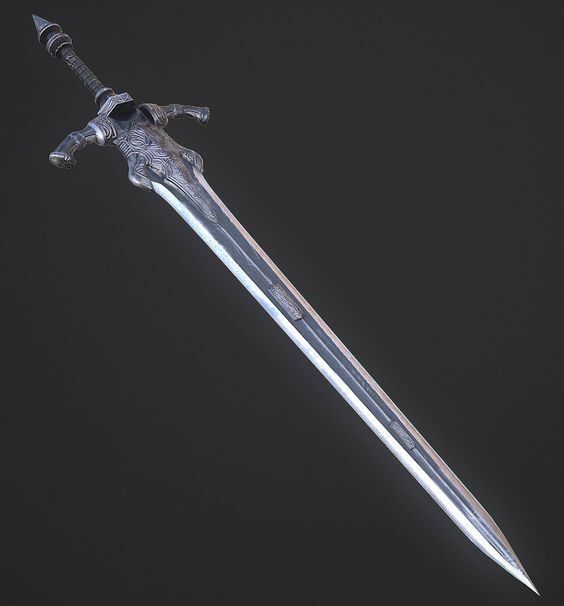 While it may be a greatsword, it can be wielded with both two hands or even one hand, allowing versatility. However, due to its larger size than a normal one-handed blade, it takes far more training - and talent - to wield it to its full potential. With years of training and with generations of knowledge on the blade, Spenser becomes a powerful fighter and protector in his own right. While he knows no magic, he respects the skill and is quite amazed, unlike most Nords. He tried long ago, but struggled to learn. Without the support of his family to learn, he eventually gave up. Other: He carries everything he owns with him: which isn't much. Of course, he is quite packed with gold, as he doesn't buy material items except replacement clothing, potions, food, etc. With him he brings health and stamina potions, spare food, water, all of his gold (what idiot bandit would try to get that from him? ), a map of Skyrim, and some sort of sweet treat. He also carried his most prized possessions: a decorative yet durable potion bottle that carries his water, a fancy spoon, his sword, and a small metal charm of a star that is tied around the neck of the potion bottle by durable rope. Personality: A man of his word, blade, and honor, he fights to protect those who need it. He often wears his heart on his sleeve, as he feels it is unnecessary to hide one's emotions lest they cause certain situations to change. His kindness and humble-demeanor often portrays him as the epitome of a knight. His generosity is given to all: men, women, and children can be at ease when the protector arrives. As an optimist, he tries to make the best of every situation, unless it is disrespectful to do so. He is not much a joker, but he will always try to make people happy again to see their smiles. When people need protecting, his courage and determination will rise above all to succeed. He has the passion to never give up in battle. Despite being a mercenary, he will help those who do not hire him but need aid for free. He has common sense, but he is not as well-educated as most mages and scholars. He is proud that he did, however, get a bit more education than the majority of Nords. His heart is surely as strong, if not stronger, than his own might. Fighting Style: As a sword and shield user, he is a melee, close-distance fighter. He is both an offensive and defensive unit, due to his sword's abilities. He never ruins straight into a battle without tactically thinking of his choices. He may not be the most scholarly, but his intellect in battle is supreme. He is quick on his feet, gives the heaviest of blows, and can defend from the largest of foes. If he had ever traveled, he would surely become one of the greatest knights in his time. However, he is happy to travel and help those in need within Skyrim, given the circumstances. But he will never give up in battle, even if it will end in failure. He may not be as brutal as his Nordic heritage says he must be, but he will fight with honor, to the very end. + Training: to better himself, of course. + Cooler weather: wearing layers of armor can take its toll in the heat of battle. + Sparring: practice makes perfect, especially when it comes to sparring. + Mercenary work: while he dislikes aiding those who may not deserve his protection, he is still happy to help, and feels as if he doesn't work a day in his life. + Children: he finds their innocence something of great value in Skyrim, and he easily reminisces on the days of his own childhood. + Sleeping in: He is not much of a morning person, and loved to sleep the day away if he can. + Alchemy: he is quite talented in alchemy for starting 13 years ago. He does not really sell his alchemy though, and rather gives potions to the poor when he can, since he makes money as a mercenary. + Sweets: food in general, but he has a sweet tooth. + Foes: by foes, it is those who he believes unfit for Nirn's true potential. Those who fight for war, rather than peace. Those who murder for selfishness, those who steal for their own benefits, monsters, criminals, corrupt politicians... the list can go on. + Discrimination: whether it be discrimination of race, origin, lifestyle, political background, gender, etc., discrimination hits a little too close to home for him. This can, at times, bring a spark of outrage from the usually peaceful fellow. + Hot weather: it is a rarity in Skyrim, but when it occurs, overheating and dehydration are horrible possibilities that Spenser hopes to never endure ever again. + Illness: another hit close to home. Hence the reason why he is so passionate about helping the poor: they often become more ill than those with healthier homes, or homes in general. Plus, the event with his sister. + Leeks: hates the taste, and certainly can taste them no matter what is attempting to cover the flavor. + Fire: to a certain extent. He believes it to be something both beautiful and destructive. + The Thalmor: From his past, it is obvious as to why he would despise the Thalmor, and hope to someday be a part of their end. While he wants to bring happiness to all, he know that to do so, he must rid Nirn of those who bring hatred. + Nightmares/PTSD: He often wakes in the night from nightmares: hence his love for sleeping in a peaceful place when he can to catch up. His PTSD is rare unless he runs into magical enemies burning people... which has only happened twice since he became a mercenary. Afflictions/Fears: He fears that he may lose more of his loved ones. He understands the hurt, pain, and sorrow of losing people so close and dear to one's heart. It is his pure drive to make others happy, their lives content again, and to find peace within a war of despair. He also fears fire: from his accident of the past, fire can be a frightening PTSD trigger for him. Now, sitting by a campfire is something relaxing to him, and watching fiery magic is entrancing to him... but as a weapon, it can trigger his past. It is another reason he dislikes too much heat. Properties: He owns no property, except for the gear he carries with him. He hopes to someday own a small home once he believes it is time to settle down. Job: Mercenary - but unlike most in Skyrim, he is chivalrous and respectful for others, and is in it for the righteousness, rather than the gold. Combat Skills: As with any mercenary, his skills with the blade is his best attribute. As a mercenary who mostly deals with surprise attacks and not as often planned ones, he is a quick both in his mind and his feet when it comes to battle. He can practically predict a move of another before they can strike, and can easily counter it and or block it. He is quite strong as well, despite not looking like a burly orc. He has the speed to outmatch (despite wielding a two-handed sword) and the strength to strike. While he may be weak to magic, with his enchanted sword, it blocks magic very efficiently. He has even managed to reflect whatever magic was shot at him back to the person who aimed it at him in the first place. It is a different type of sword to deal with, being a light-weight yet hefty two-handed sword with superior blocking capabilities. This makes him easily outshine other mercenaries. With the help of his father's training years ago, he also managed to learn how to wield such an odd sword. Because of his armor and career, sneaking is not much of a necessity. However, he has very keen hearing, and is observant enough to find assassins from afar. It is his job, at times, anyways. + He is a happy drunk: he never drinks on the job, of course. And he never intends to become 'wasted': he has never gotten to the point of no return when it comes to drinking, but every now and again, with a cozy and happy enough atmosphere, he may become a bit tipsy. When he does, he's certainly a happy guy you want around. + Despite being optimistic, no one is truly 100% happy. Because he wears his heart on his shoulder, it is easy to tell if he is upset by something. If caught, however, he will often brush it aside to push forward forced optimism. He will, however, after being acquainted with someone, express his true thoughts and emotions. He isn't one to hide it, which often makes the heartier Nords ridicule him for being open about such things. However, he does it in his older sister's honor. + Unlike most Nords, he does not worship Talos. This is one thing he is not very open about. However, he is very respectful to Talos, as he know that he was once a great Nord who deserves to be honored. He prays to the eight when need be, but most of all, Stendarr, Kynareth, and Mara. + He is becoming better with alchemy in due time. He was one of a happy family of five. He was the middle child, with a mother, father, older sister, and baby sister. Growing up was something that he would always cherish. Playing with his older sister in the garden, practicing with the sword, and eating his mother's pies. His older sister, Kynithia, was three years older than him. She was named after the Goddess Kynareth, and he, after the God Stendarr. They both, ended to live up to their names. His father would teach him to be strong, his mother taught him to be emotional, and his sister taught him to be kind. While he followed in his father's footsteps of being a swordsman, his sister followed the broken path of his mother. Her mother had begun to be an alchemist, becoming very talented. However, she ended up settling down and having Kynithia with her husband. Taking whatever notes his mother had, Spenser's sister brought back to life her mother's lost career. She was extremely talented, and often tested harmless mixtures on her younger brother, simply because he was always watching her. He was always curious and facinated by her work. As she grew older, she began teaching Spenser her alchemy, which amazed him even more so. At the age of ten, Spenser's mother gave birth to his younger sister. She was named Marin, after the Goddess Mara. Both siblings adored their younger sister, and helping her grow to be strong and beautiful was no exception. The next few years were just as great as his childhood. The family dinners, late night star-gazing, and simply being next to the warm fires in the winter. They all loved each other dearly, despite some obvious differences. While his father was a supporter of the soon-to-be Stormcloaks, and his mother, the Imperials, they all still loved each other the same, no matter the political differences. They let their children grow ignorant of the civil war, allowing them to choose their own path in life when the time was ready. This peace would end, however, in the flames of civil war. One night, while the family was asleep, Spenser awoke to a mysterious noise outside the home. Being a curious thirteen-year-old, he grabbed his father's sword - the one he wields to present-day - and left the house. With the sounds of footsteps running into the forest, Spenser ran after them, assuming they were bandits. He did not want them to escape if they had stolen something. However, as he chased them, he lost sight of them. He continued to wander the forest, looking for the perpetrators. He had heard that bandits had attempted to raid a neighboring house a few nights earlier, so he wanted to search for them. Despite his efforts, he never found the 'bandits'. He did, though, find something far worse. A light in the distance, and a large plume of smoke rising. It must have been burning for quite some time, to be so alight. But that direction, was his home town. Without a second thought, he ran towards the light. Closer and closer he came, he could hear the screams: his family. Tears streamed down his face as he ran, finding his home alight in the flames of fate. He could hear their screams: his mother... his father... his sisters... He went to run inside, but the townsfolk held him back, knowing that no amount of water buckets could stop the flames. But he was strong, and with such adrenalin, he escaped their grasp, running into the flames. He could feel the fire licking his arms and legs, burning his clothes. At the time, he could not feel such physical pain: but rather, the burning of his heart of devestation. He ran to the first room, his parent's room, finding it completely engulfed. He shouted their names, with no response. Then he heard the cry of his baby sister: only age of three. Running to his sisters' room, he fell through the floor, caught on burning wood. He screamed in agony, trying to pull his leg out of the planks. Finally he managed, falling to the ground. He coughed, the smoke becoming far too heavy. But he would press on. Finally he made it to his sisters' room, the door on the ground already engulfed. He could barely step into the room. The heat was too strong, his limbs burning, as well as his lungs. He could barely see, but he would not stop. All he needed was to save one; at least one. He pressed on, managing to reach the crib. To his horror, he could see the still burning remains of his dearest Marin. He let out a blood-curdling scream that struck fear in townsfolk. Then, without another second, the home collapsed on itself, trapping Spenser with his deceased, and still burning, family. A few townsfolk ran inside, hearing his weak coughs and shouts for help. They managed to pull him out, patting away the singed clothes. His body was covered in burns and cuts, and his lungs filled with smoke. With the inability to breathe, Spenser became unconscious, allowing townsfolk to give chest compression to make him breathe again. It took him three days before he was able to awaken. His body was sore, his breathing uneven, and his life weakened. Despite their attempts to keep him away, he needed to see his family. He approached the house, limping, gaining the help of a local friend. The house was still smoldering, ashes blowing from the light breeze. The house no longer had the warmth it did days ago. It was cold, barren, and left with the glowing embers of memories nevermore. He broke down, crying on his knees, unable to witness what was left of his home. Flashes of his sister's burning body, the sounds of his family's screams, the smell of burning wood and bodies... he broke into a PTSD attack: the first of many to come for the rest of his life. His friend was there to comfort him for the entire time, allowing him to take his time as he shook; crying and screaming. There they sat, an hour after he had stopped his attack, allowing him to stare at the house. Spenser grew with courage, and attempted to rummage through the house, due to the rain that would come the next day. He wanted what was left. His friend warned him that it might be best for him to wait, but he was reluctant, and wanted to be with his family. There was very little left, considering that most of the items they owned were flamable. What brought him at least a bit of joy were the few items he found that survived: a few of Kynithia's potion bottles that were not melted, one of a few of his mother's valued spoons, and a metal charm that was on Marin's blanket that was no more. He ended up taking his mother's favorite spoon, his older sister's nicest potion bottle, and and baby sister's charm. It took him some time to find anything of his fathers: that thing being, his sword. Spenser was preparing for the worst: assuming that it had been in such high temperatures that it would be warped and never the same as it once was. However deep within the ashes, he found the sword, surprisingly unscathed. It made no sense. He found his father heating it every now and then to make sure it was in tip-top shape, changing the shape of it at times. How could the sword act as if it had never touched a flame? Then a glistening gold and black caught his attention. It was a gauntlet, black with designs of gold, stuck within the burned remains of a bush. He walked over to pull it out for the blackened twigs, knowing the exact origins of the gauntlet: the Thalmor. Instead, he vowed to protect those who need it from around Skyrim. He never wants others to suffer as he and his family did. Thus, as he grew up in the home of his friend, he continued to practice his swordsmanship and alchemy in honor of his family. When he came of age, he left his hometown, and began his life as a mercenary to help those in need. While his family named him after the God Stendarr for purposes unknown, it was true that the fate to aid others in need, give to the poor, to heal those who need healing, and to be kind and generous to all people, would follow Spenser: just as Stendarr would want him to do. And with the love of Mara and spiritual care of Kynareth, he would honor his family and live a life to help all have a better life of their own. Ah! Yup! I'm slowly working on it while packing. Starting with the basics, haha! You are right! I cannot wait to ship it oh my goodness! !